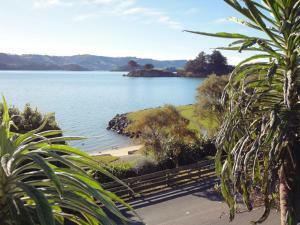 Set in the garden at Chy-an-Dowr, opposite a small beach on Otago Harbour, Rosemary Retreat offers free WiFi, a patio, and a garden. It is 20 minutes' drive from the Royal Albatross Centre and Penguin Colonies. Rosemary Retreat is 20 minutes from Taieri Gorge Railway and Dunedin City. It is 25 minutes' drive from Forsyth Barr Stadium. This apartment offers a fully equipped kitchen, a dining setting and a lounge area with a TV. The private bathroom features bathrobes and a shower over a bathtub. You can enjoy garden views and free on-site parking. Complimentary cereals, milk, fruit, tea and coffee are included.